NJB Article and Source Repository: Neanderthals Left a Genetic Burden to Modern Humans. Neanderthals Left a Genetic Burden to Modern Humans. 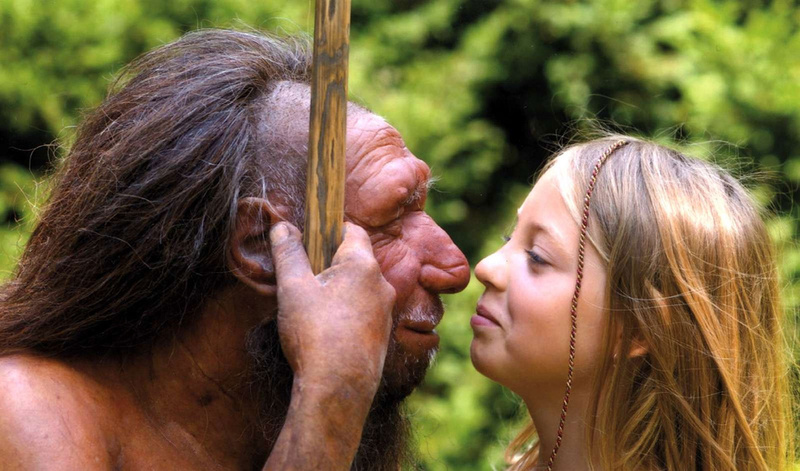 A reconstruced Neanderthal with a modern human girl. Neanderthal Left Humans Genetic Burden, Scientists Say. Sci-News.com, June 6, 2016. Neanderthal Mutations Could Still be Affecting Humans. By Daryl Worthington. New Historian, June 7, 2016. Here’s why human women probably struggled to have babies with Neanderthal men. By Rafi Letzter. Tech Insider, June 6, 2016. The Divergence of Neandertal and Modern Human Y Chromosomes. By Fernando L. Mendez et al. American Journal of Human Genetics, Vol. 98, No. 4 (April 7, 2016). PDF. The Genetic Cost of Neanderthal Introgression. By By Kelley Harris and Rasmus Nielsen. Genetics, Vol. 203, No. 2 (June 2016). PDF. Several previous studies revealed that Neanderthals were much more inbred and less genetically diverse than modern humans. For thousands of years, the Neanderthal population size remained small, and mating among close relatives seems to have been common. Then, between 100,000 and 50,000 years ago, anatomically modern Homo sapiens left Africa and moved to the homelands of their distant cousins. The two groups interbred, mingling their previously distinct genomes. But though a small fraction of the genome of non-African populations today is Neanderthal, their genetic contribution is uneven. Neanderthal sequences are concentrated in certain parts of the human genome, but missing from other regions. “Whenever geneticists find a non-random arrangement like that, we look for the evolutionary forces that caused it,” said Dr. Kelley Harris of Stanford University. Dr. Harris and her co-author, Dr. Rasmus Nielsen from the University of California, Berkeley, and the University of Copenhagen, hypothesized that the force in question was natural selection. In small populations, like the Neanderthals’, natural selection is less effective and chance has an outsized influence. This allows weakly harmful mutations to persist, rather than being weeded out over the generations. But once such mutations are introduced back into a larger population, such as modern humans, they would be exposed to the surveillance of natural selection and eventually lost. To quantify this effect, the scientists used computer programs to simulate mutation accumulation during Neanderthal evolution and to estimate how humans were affected by the influx of Neanderthal genetic variants. “To assess the fitness effects of Neanderthal introgression on a genome-wide scale, we used forward-time simulations incorporating linkage, exome architecture, and population size changes to model the flux of deleterious mutations across hominin species boundaries,” the scientists said. The results, published in the journal Genetics, suggest that Neanderthals carried many mutations with mild, but harmful effects. The combined effect of these mutations would have made Neanderthals at least 40 percent less fit than Homo sapiens in evolutionary terms. Today, Neanderthal sequences make up approximately 2 percent of the genome in people from non-African populations. But the scientists estimate that at the time of interbreeding, closer to 10 percent of the human migrants’ genome would have been Neanderthal. Because there were around 10 times more humans than Neanderthals, this number is consistent with the two groups acting as a single population that interbred at random. Although most of the harmful mutations bequeathed by our Neanderthal ancestors would have been lost within a few generations, a small fraction likely persists in people today. The team estimates that non-Africans may have historically had approximately 1 percent lower reproductive fitness due to their Neanderthal heritage. This is in spite of the small number of Neanderthal gene variants thought to be beneficial today, including genes related to immunity and skin color. Breeding with Neanderthals may have had a heavy price for early humans, according to a new study published recently in the journal GENETICS. Harmful mutations present in the genome of Neanderthals made them up to 40% less fit reproductively than modern humans, according to the study. Although most of the effects have since been lost to time, these mutations likely passed to non-African humans when they interbred with Neanderthals. It is suggested that the mutations could still be affecting the fitness of some populations today. The study was led by Kelley Harris of Stanford University, along with her colleague Rasmus Nielse, from the University of California Berkley and Copenhagen University. It is now widely accepted that modern humans interbred with Neanderthals, our closest extinct genetic relatives, with between 2% and 4% of genetic material in modern, non-African human populations having a Neanderthal origin. A study published earlier this year suggested that anything from the risk of depression to nicotine addiction could be connected to the mixing of human and Neanderthal genomes. Due to their smaller, more concentrated population, inbreeding was much more common among Neanderthals than modern humans, leading to their decreased genetic diversity. Harris and Nielsen were particularly fascinated by the fact that the Neanderthal genetic contribution to the modern human genome is uneven, but not random. Neanderthal sequences tend to be concentrated in certain areas, but totally absent elsewhere. “Whenever geneticists find a non-random arrangement like that, we look for the evolutionary forces that caused it,” Harris remarked. They hypothesised that the explanation could be found in natural selection. In small populations, like the Neanderthals, natural selection is less effective, allowing mutations to persist and have a larger influence. If such a mutation is introduced back into a larger population (such as modern humans) however, it’s quickly lost in the march of natural selection. To understand this process, Harris and Nielsen used computer programs to simulate mutation accumulation during Neanderthal evolution and estimate how humans were affected by the influx of Neanderthal genetic variants. They concluded that Neanderthals would have carried many mild, harmful mutations, combining to make them 40% less fit than humans in evolutionary terms. Their results also suggest that humans and Neanderthals had actually interbred much more freely and frequently than previously believed. The findings suggest that thousands of years ago, when both humans and Neanderthals inhabited the earth, closer to 10% of non-African humans’ genomes would have been Neanderthal. Shockingly, Harris and Nielsen suggest that a fraction of the harmful Neanderthal genetic mutations could still be present in modern human populations. They estimate the result could be a 1% lower reproductive fitness in modern day non-Africans. Imagine a couple living between 39,000 and 45,000 years ago. She’s a human. He’s a Neanderthal. Their families aren’t thrilled with the union, but they’ve learned to deal with it. Their union isn’t all that unusual after all – enough humans and Neanderthals made babies together in the 5,000-plus years that the two species coexisted that modern humans now owe about 4% of our DNA to our extinct nonhuman kin. That mystery may have puzzled them, and its genetic legacy has puzzled modern scientists as well. While traces of all sorts of Neanderthal DNA show up in the human genome, scientists haven’t found any Neanderthal Y-chromosomes – the chromosomes fathers pass to biologically male children. That doesn’t necessarily mean the Neanderthal Y-chromosome is extinct, but it makes it likely. But a study published recently in the American Journal of Human Genetics suggests an alternate explanation: Human women may have been unable, or at least struggled, to carry male half-Neanderthal fetuses to term. That’s because of three genes found on the Neanderthal Y-chromosome that are known to trigger immune responses in human beings. Those genes could have caused human mothers’ immune systems to attack male half-Neanderthal fetuses, triggering miscarriages. The paper’s authors caution that their results are not conclusive – they’ve identified a possible cause, not shown it to be the case. But for bemused parents at ancient play groups full of little half-Neanderthal girls (as well as modern scientists) this result might have sated some curiosity.